Over the next two weeks Lompoc Brewing will be hosting a special bottle release for Barrel Aged Derail Olde Ale on March 9 and will usher in the return on Night of the Living Red an evening of red ales on March 16. Both events will take place at Sidebar, just around the corner from the Fifth Quadrant Brewpub on North Williams. The bottle release for Lompoc’s Barrel Aged Derail Olde Ale will take place on Wednesday, March 9 from 4:00pm until close. 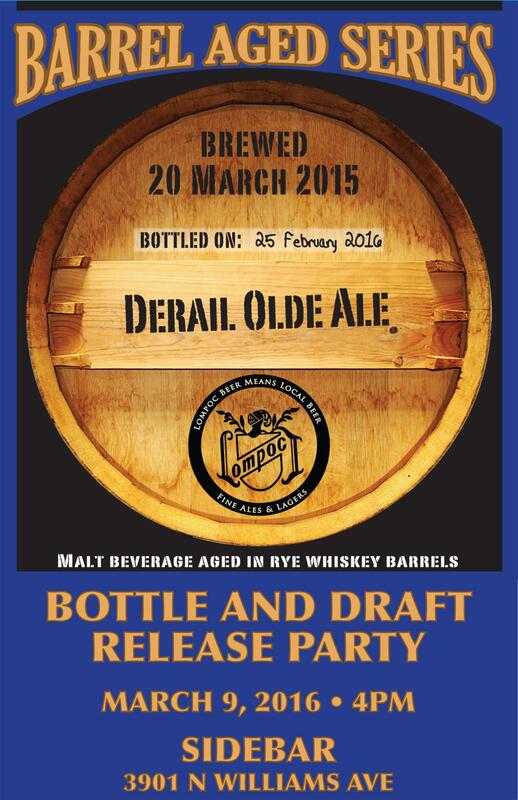 Sidebar will be pouring Barrel Aged Derail Olde Ale on draft and will be selling bottles to go. This beer was created as a collaboration with Lompoc bartender Cody Bottorff. Barrel Aged Derail Olde Ale is an English style Olde Ale that was aged in Heaven Hill Distillery Rye Whiskey barrels for eight months. The beer is described as featuring a fruity nose with a malty body and flavors of toffee, oak and a hint of sherry. 5.6% ABV. The return of Lompoc’s Night of the Living Red will take place on Wednesday, March 16 from 4:00pm until close. 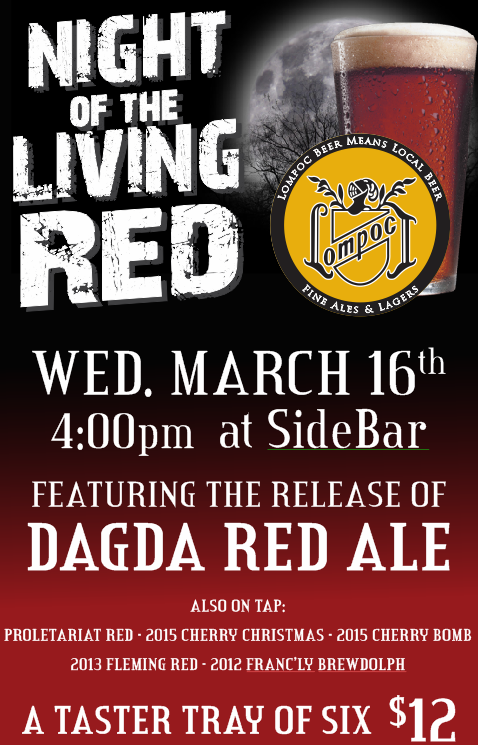 This year’s Night of the Living Red will feature a taplist of six red beers all from Lompoc. Patrons can purchase a taster tray of all six beers for $12, or buy each beer individually. Here’s the beer list for Night of the Living Red along with descriptions provided by Lompoc.